Tremendous article at State of the Nation discussing the real reasons behind the staged terror attacks in Paris on Friday, please click over there–links below–to read the whole analysis which includes information on various aspects of the upcoming planned Climate Summit including planned protests that apparently have been targeted by these attacks–small excerpt below. There should be no doubt that the number one reason for the alleged Paris Terror attacks is to completely lock down Paris in order to totally control the upcoming “Climate Summit”. That’s not to say there aren’t other very significant purposes operating in the background, especially some quite stealthy geopolitical strategies involving the Middle East. Nonetheless, there can be no overstatement about the profound importance and dire urgency of this global meeting which is known as the 2015 United Nations Climate Change Conference. This summit represents the culmination of the ruling elite’s plan to establish their New World Order (NWO) via a One World Government ostensibly based on the global regulation of carbon emissions. Whereas Global Climate Change (aka Global Warming) is their mantra, the Global Carbon Control Matrix is their penultimate objective on the way to their One World Government. • First, the GCCM will serve as the legal and political foundation for a new framework of international laws and treaties regarding CO2 emissions. • Secondly, the GCCM will provide an enforcement mechanism by which those laws and treaties will be administered and monitored … and especially enforced. • Thirdly, the GCCM will function as a global taxation authority in order to provide the necessary tax revenue which will support the emerging One World Government. • Lastly, the GCCM will operate as a full-blown supranational CO2 management regime with unprecedented political and police powers, as well as unparalleled financial and economic prowess. The Paris Climate Summit will also be used as an opportunity to greatly advance U.N. 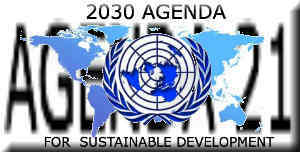 Agenda 21, as well as to further concretize the more evolved 2030 Agenda for Sustainable Development. Both of these longstanding agendas are critical to the success of the NWO scheme to effectively control every single natural resource on the planet. What is equally crucial to the outworking of their clandestine agenda is to eventually exert absolute command and control over the weather—worldwide. Through various geoengineering programs the globalist cabal intends to conduct both weather modification and climate engineering wherever and whenever they so desire. The reader now knows why the World Shadow Government has relentlessly suppressed every form of free energy technology ever invented. It is only through the fascist administration of the upcoming Global Carbon Control Matrix that they will be able to fulfill their NWO dream (our nightmare). For it is only within the present context defined by the various CO2-emitting energy paradigms that such a GCCM makes any sense. However, the proper implementation of their clandestine plan always called for utmost secrecy in the past. With the internet operating at full tilt — 24/7 — the cyber crackerjacks and super-sleuths now catch the agents of the cabal with the matches in their hands before their arson fires are even put out. The really key point here is that all of the usual suspects are now notorious throughout the World Wide Web. They have actually been caught by the very web of their own making. Many of them are now well known by their predictable actions and negligent inactions, as well as by their dubious organizations and personal associations. SOTN fully recognizes that the staged Paris terror events demonstrate the resolve of the World Shadow Government to foist their NWO agenda on the entire planetary civilization … by any means necessary … and by every means possible. What’s next? Solutions to follow. Please visit State of the Nation for the whole article and please stay tuned to their suggestions as they unfold. This site will continue to post all peaceful actions and recommendations for We the People to effect change and oppose totalitarianism peacefully, as well as further information on all these subjects. Please take the time to understand further what Agenda 21/2030 is all about–some articles on this site (I will continue to post), please use the Search feature on top–and think about what you personally can contribute in the way of assisting humanity at this supremely critical juncture in world history. One powerful and effective thing we can all do, I highly recommend it, is meditate, regularly and continually….we need to get some Right-Energy waves out there, shaping our Unified Field! Our thoughts and intentions count, let’s use them. This entry was posted in Agenda 2030, Agenda 21, Global Governance, New World Order, One World Government and tagged Agenda 2030, Agenda 21, Climate Summit 2015, Global Governance, One World Government, Paris attacks. Bookmark the permalink.